‘Where! ?,’ the four other people in the truck asked anxiously as we scanned the river bank. 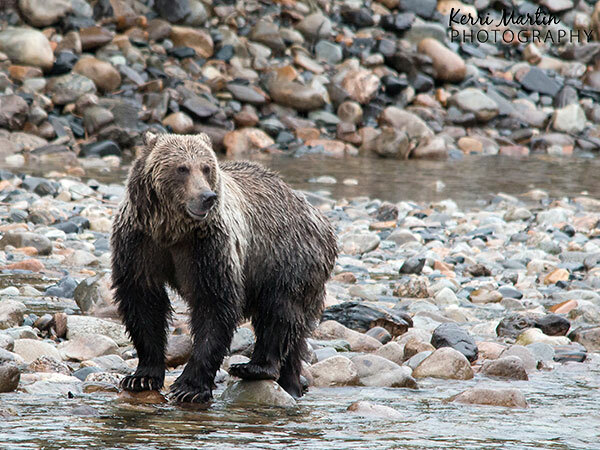 Our eyes adjusted to the dark and subtle movement allowed the rest of us to see what Gemma had spotted – a large grizzly bear ambling along the opposite bank of the river. It was late dusk and the light was almost non-existent. I pulled out my camera – aperture open as far as it could go, shutter speed as low as hand-held would allow, ISO maxed out at 128000 – and desperately hoped my lens would absorb the last bit of light from the atmosphere. It was no use – I couldn’t even see to focus. ‘Put your camera down and just watch Kerri,’ a voice inside me said. Capturing images not being an option allowed me to just ‘be there’ with my fellow bear watchers. For about 5 minutes, we quietly followed the bear on our side of the river. Each clearing afforded us a view of the large grizzly on the opposite shore, moving through the darkness. He was surprisingly silent as he navigated the network of log debris with the grace of a dancer, dipping in and out of the water, plucking out the spawning Kokanee Salmon for his much-needed pre-hibernation nutrience. His name was Kiwi (which I love because this was my nickname as a kid) and this large male grizzly was one of several grizzly bears we got to observe during our four day stay at the Grizzly Bear Ranch in Southern BC. The experience was a grizzly bear lover’s dream, with the days packed with bear viewing and educational activities. The 12 guests were broken into smaller groups of four for various excursions, including white water rafting, driving tours, tracking and hiking. The activities were led by one of the expert guides employed by the ranch, all of whom had unique perspectives and experience with bears, outdoor activities and wildlife in general. My friend Marcy and I were grouped with Gemma and Paul, a couple from the UK who was visiting Canada for the first time and had never seen a bear in the wild before. One might think this lack of experience in bear viewing would be a handicap for them. One would be wrong. The couples’ excitement and enthusiasm made them bear (and wildlife) spotting pros. In fact, they were usually the first to point out the various bears we saw on our excursions. I still don’t know how Gemma spotted Kiwi on the opposite side of the river in near dark! She kept saying her eye sight wasn’t great, but she was obviously in tune with the bears. Marcy and I were lucky to have them on our team. So how did I learn to put my camera away? Well to be honest, I haven’t completely let that lesson sink in – yet – but this experience got me thinking about what happens when I’m behind ‘the glass.’ Sometimes I find my camera adds to my ability to be present. Sometimes my camera – or the desire to get good pictures – takes me to a place where expectation overrides the experience itself. The Grizzly Bear Ranch experience highlighted this precarious balance. I went to the ranch knowing the activities would not always be conducive to photography. The rafting, for example, did not allow big lenses. We were told not to bring ‘expensive’ camera equipment on the boat at all, but I was so set on capturing a grizzly from the water that I risked taking my extra camera body and lens. My camera survived the rafting but I did not end up using it. I was only planning on taking it out if we saw a grizzly up close, and we didn’t. There were lots of other beautiful sights – schools of vibrant pink salmon, hundreds of bald eagles, several american dippers – but the lack of grizzlies on the river during our rafting treks meant my camera remained tucked in my pocket in a plastic covering. Some of our bear sightings were in poor light (like Kiwi), others were quick glimpses of far off bears. 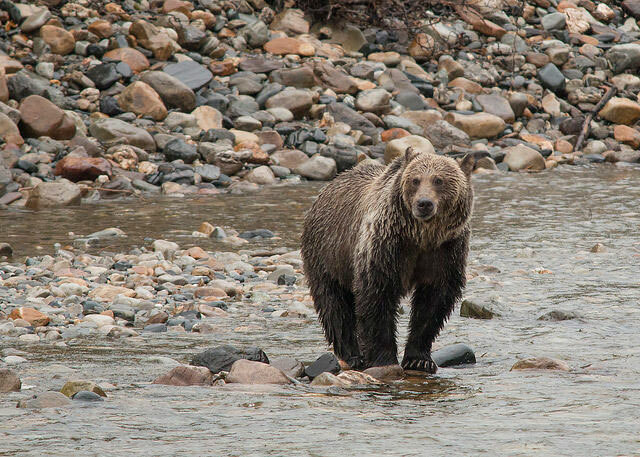 A few times grizzlies were spotted somewhere along the river and the guides did their best to anticipate their route. The group or vehicle would be positioned in a non-obtrusive place with a good view and we would wait. But alas, the bears decided to change their course – as they often do for various reasons. Such is wildlife viewing in a natural setting, but I was getting disappointed in the lack of good photo ops. Whenever I find myself feeling frustrated with mother nature for not presenting her beauty in the best light/circumstance for photography, I know I need to take a breath and just chill. It’s not mother nature’s job to provide me with good images. It’s my job to be open to her beauty, to appreciate the miracle of what I get to see, regardless of whether it is ‘capturable’ or not. The images scattered throughout this post are of Harry, the one bear I had a clear view of and decent(ish) light. 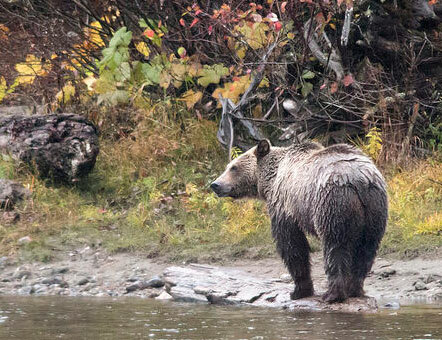 I’m happy with the images – I was aching to capture a grizzly in the water with a fish. He is quite a character and was really fun to watch. But when I think back to the four day experience, it was the Kiwi encounter that stands out in my memory, despite the fact that I don’t have any good photos. 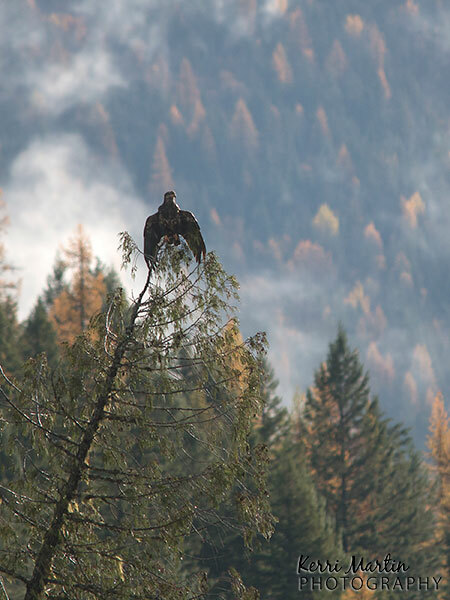 His slow walk along the dark edge of the river resonates as an homage of the life of a grizzly in the late fall. I am honoured I got a chance to witness it, along with Marcy, my new friends Gemma and Paul and our guide Paul. Even without the physical presence of the grizzlies themselves, the environment at the ranch was over-flowing with the energy of these remarkable creatures. It showed up in the foot prints the grizzlies and other wildlife left in the mud, the beauty of the misty landscape speckled with the vibrance of fall, the spawning kokanee salmon that attracted, not only grizzlies, but hundreds of bald eagles, and the ranch guests and guides that were blessed with the opportunity to soak it all in. What more can I say? It was a remarkable trip and I am grateful for the experience. I have been purposely vague about the specific location as it is a sensitive area, but I strongly encourage anyone who is interested in visiting the ranch to check out their website.